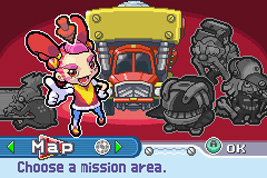 Doug, the leader of the Red Dozers gang, has been attacked by the Skullker gang, and the Red Diamond has been stolen. Doug's daughter, Jill, is put in charge of the Red Dozers and tasked with retrieving it in her powerful Drill Dozer. 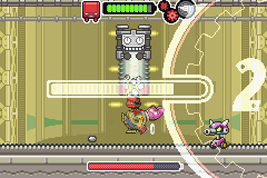 By pressing the L and R buttons, the Drill Dozer's drill is activated, allowing Jill to charge through enemies, break down walls and activate machines. The rumble cartridge provides feedback when drilling. 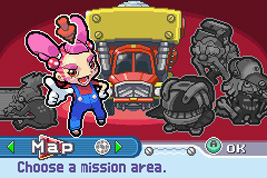 In each stage you can find chips for purchasing items in the store, and Gears for powering up the Drill Dozer. There are two gears in each stage, and both must be collected to progress. The costume worn by the female hero in Pokémon: FireRed & LeafGreen. Based on Mario's blue dungarees and red shirt. The beads in her hair have a spotted mushroom pattern. Based on Pulseman, a title developed by Game Freak on the Sega Genesis (Mega Drive). Believed to be based on the Frog Suit from Super Mario Bros. 3. Based on Nurse Misaki Hayama from Game Freak's Japan-only PlayStation game Click+Medic.